For Stacy Horn, regardless of what is going on in the world or her life, singing in an amateur choir-the Choral Society of Grace Church in New York-never fails to take her to a place where hope reigns and everything good is possible. She's not particularly religious, and her voice is not exceptional (so she says), but like the 32.5 million other chorus members throughout this country, singing makes her happy. Horn brings us along as she sings some of the greatest music humanity has ever produced, delves into the dramatic stories of conductors and composers, unearths the fascinating history of group singing, and explores remarkable discoveries from the new science of singing, including all the unexpected health benefits. 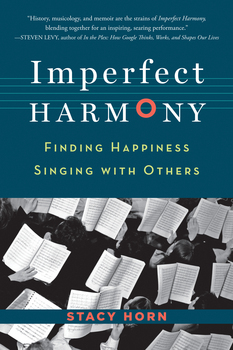 Imperfect Harmony is the story of one woman who has found joy and strength in the weekly ritual of singing and in the irresistible power of song.